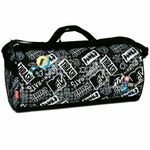 Great Original and Official MTV Trash sports travel bag. With 55cm this bag has plenty of space and best of all it comes with a cool Retro MTV design. The original one that is.